Whether you embrace the whole Valentine’s Day spectacle or scorn the mushy outpouring of sentiment, one thing is evident……. there is a definitely a market for love! In the shortest, but bleakest month of the year, who can blame people for getting excited about a few red hearts and an opportunity to be nice? February is grey and cold, trees are bare and the signs of spring are not yet abundant enough to hint at hope. Whilst most months have some sort of excuse for celebration, February’s only real joy is that it is a short month! So, a little love can go a long way in February. On the business front you are probably still suffering from reduced footfall or customer interaction, unless you’re in the heating trade, so it’s a great time to set the groundwork for your next peak period and take stock of what is happening within your own team. Successful businesses are constantly monitoring their biggest asset; their team of employees. Unless you are a one-person business, you will be placing your trust in team members to represent your business and maintain the same standards that you, yourself, hold. 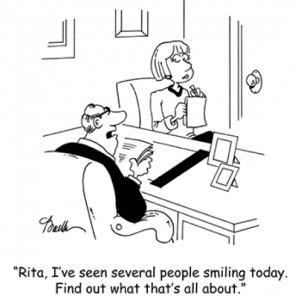 So when was the last time you asked your team how they felt about your business? As your greatest ambassadors, you can be sure that their attitudes and views will be apparent to your customers. A demotivated, aggrieved and negative team member will hardly be transmitting positive, cheery signals. In our experience, the best way to ascertain how your team FEEL about working for you is that very basic, but very effective, tool – a staff survey. It is simply impossible to make any productive changes within your business if you have no idea as to how your team members FEEL. If your goal is to increase your turnover and profits this year, you need your team to be just as motivated as you are. And not just your customer-facing team, but everyone who has a role in your business. Research shows that when an individual works with a positive mindset, performance on nearly every level – productivity, creativity, engagement – improves considerably. There are hundreds of ways to create positive feelings within your team and you should obviously implement schemes of reward based on your own business. Achievement and recognition are high motivators for employees. If they do something well, reward them. Present them with a voucher to go out for dinner, an extra day off, tickets to a show, etc. The small things adds up. Create spaces where employees can easily communicate and share ideas. Casual conversations in the staff room can become collaborative conversations. Make it inviting and effective, with nice furniture, tables, and snacks and beverages, if possible. Have a monthly team prize for the best performer. Make the team WANT to strive for more. Create a career pathway – make your team WANT to stay with you. Create opportunities within the business and listen to them often, so you can help retain them long term. Supplement salary by assisting employees in other areas of their lives. You can offer an extra level of life insurance or disability insurance for employees to protect their incomes. Other ancillary benefits, such as dental and optical care or gym memberships, are all well received by employees. It is important to offer benefits of some kind so your employees know that you truly care about them and their families. Your expression of love and interest in your team doesn’t necessarily have to cost money or be extravagant. A simple plate of homemade biscuits or maybe an extra 15 minutes at lunch time says a lot. A staff survey is a quick, easy and extremely transparent way of capturing the feelings amongst your team. The results of a survey can indicate gaping holes within your business that you, yourself, simply do not see. At the very least, implementing a staff survey shows that you CARE what your team thinks. How you use that information is up to you, but it is a great way of initiating a more positive and cohesive feel amongst your most important asset. Call us for more information about how to easily set up a staff survey for your business. PS Speaking of Valentine’s Day, whether you’re male or female, please avoid the “I don’t need Valentine’s Day to show my partner I love her/him – every day is a day of love in our house”. It’s an overstated cliché and an obvious sign that you’re too cheap to shell out on some flowers or chocolates! Go on, indulge in some romance.